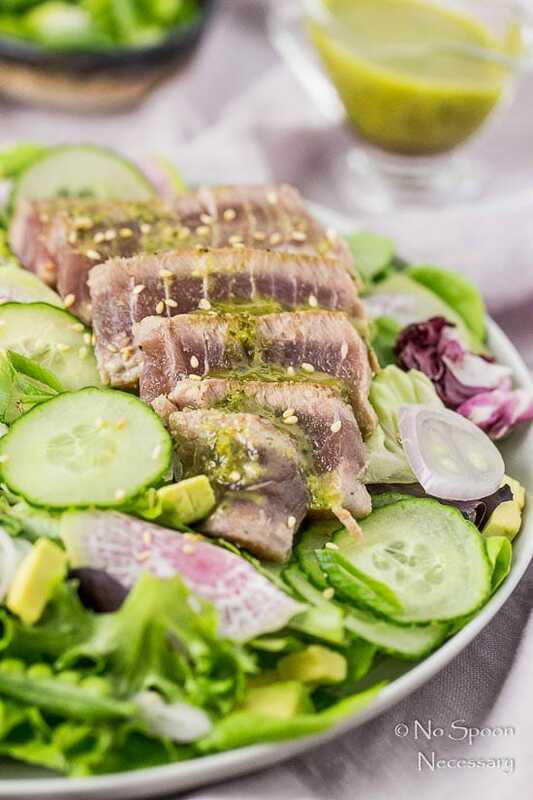 This Ahi Tuna Spring Salad is loaded with fresh ingredients, topped with perfectly seared tuna, and finished with an Asian Vinaigrette. 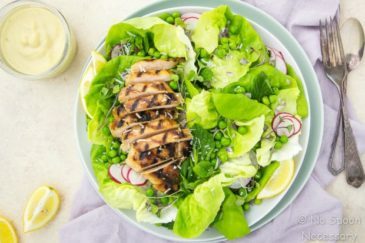 It’s healthy, packed with protein and guaranteed to become one of your favorite spring salads! Hi friends! Happy two days until the weekend! Wahoo! So, today I have a real life question for you guys. And, I actually mean real life. I know I’ve said that before and it was in jest. But today, I mean it. I’m asking this question because recently someone took the time out of their busy day to leave me an inspiring comment. (<– Said dripping with sarcasm) They wrote me to let me know that my food looks unappetizing and disgusting. Clearly they aren’t a fan of my photography, although I’ve never claimed to be a professional. Obviously there were a lot of things that ran through my head when I read the comment. And, being human, most of them were choice words. I mean, this is my hard work someone just metaphorically crapped all over. So, how did I handle the comment? Well, I didn’t sink to their level of unkindness, that is for sure. Instead, I wrote them back to let them know I appreciated their comment and was sorry they felt that way. Of course I muttered to myself that they don’t need to pay any more visits to my website… I mean, it’s not like I have a gun to their head forcing them to look at my “repulsive” photography. So, that comment lead me to pondering why people feel the need to be mean. My home girl, Rachelle said, “You know you’ve made it when you get hate mail”. Ha. Gotta love her outlook, but it must be something more than that. So dear friends, riddle me this – what motivates meanness? Alright, enough heavy talk. I’ll get to the good stuff. Delicious eats. 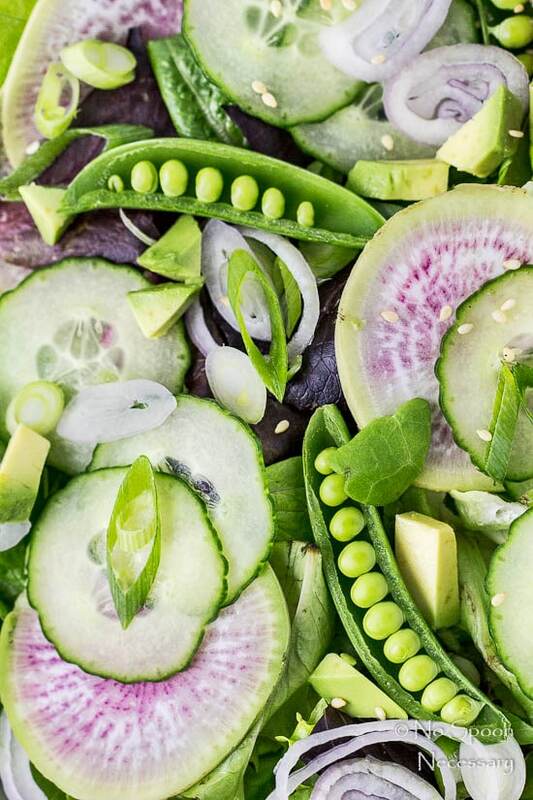 This salad is cool, crisp, refreshing, healthy and packed with protein and veggies. And (despite what one reader might think), it’s seriously pretty too! 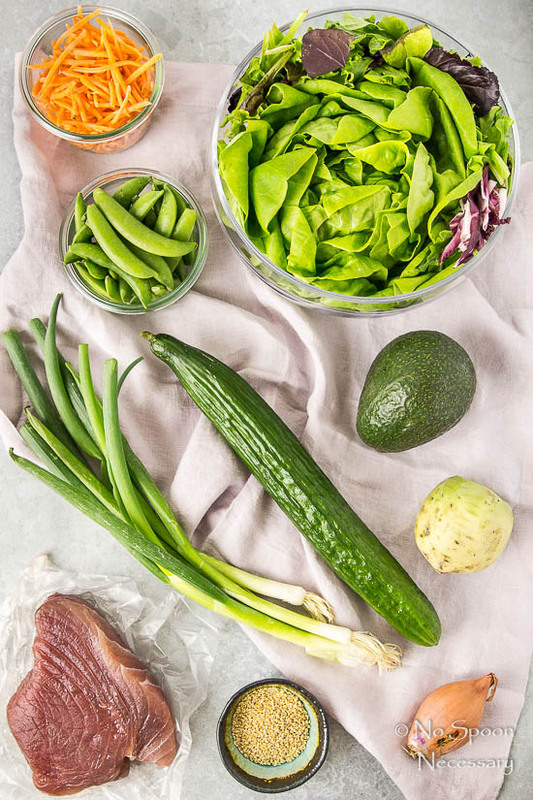 This beauty is loaded with fresh ingredients that your gimme-all-the-things-spring self craves – creamy avocado, garlicy shallots, crunchy snap peas, cool cucumbers, bright watermelon radishes and crisp lettuce. 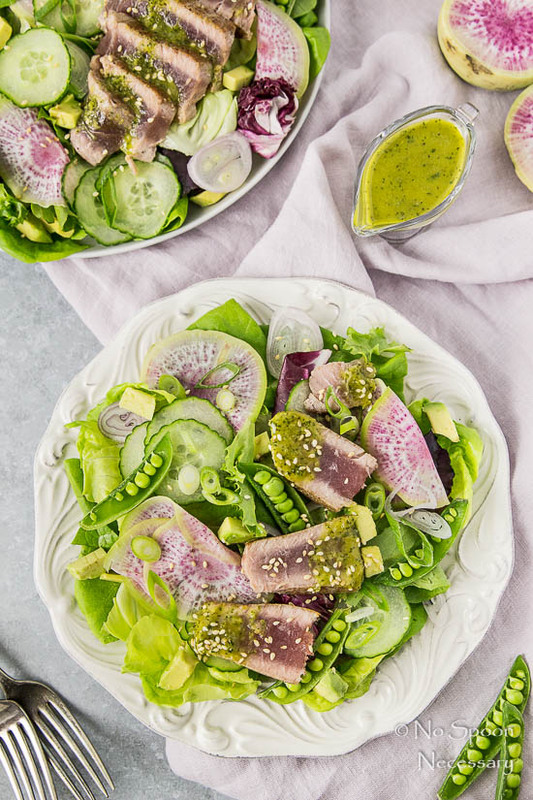 Honestly, the veggie portion of this spring salad is delish on its own, but the meaty, protein packed, perfectly seared ahi tuna takes this salad to a new level of yum. And, of course every salad needs a dressing. I decided to finish this salad off with a light Asian inspired vinaigrette. 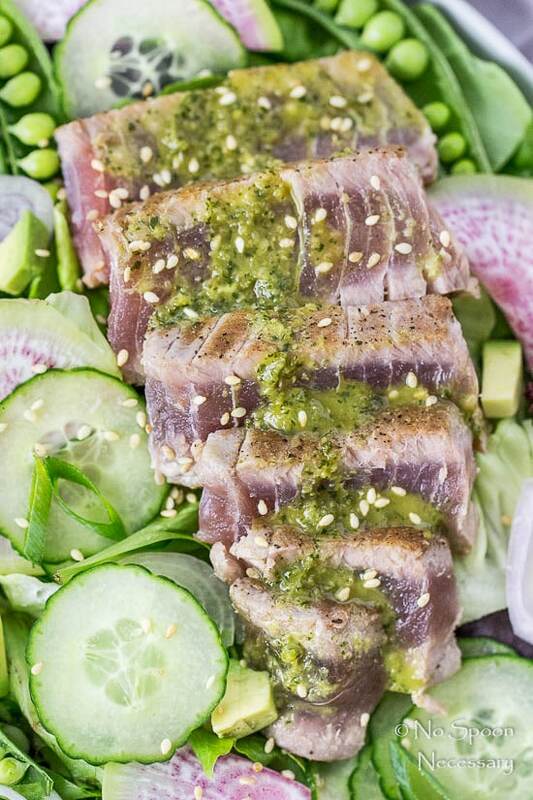 It is herbaceous, silky, luscious and delivers just the right amount of mellow Asian flavor to the tuna and spring greens. If you look at the first picture of ingredients you will see shredded carrots. I had every intention of using them, but completely forgot. By the time I remembered, I decided the salad didn’t really need it. Feel free to add them to your salad, or leave them off… whatever floats your boat. I like my tuna rare, so I seared mine for a minute and a half on each side. If you want yours more well-done, simply cook it a couple minutes more per side. 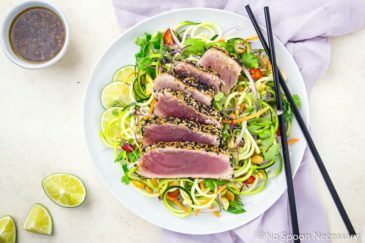 If you want your tuna to have more flavor – cook and slice the tuna, and then gently toss it with a bit of the vinaigrette. Allow the tuna to sit in the vinaigrette while you prepare the salad. The Asian vinaigrette will keep up to 2 days in the refrigerator. Just make sure you vigorously shake it to emulsify before using. 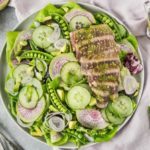 Packed with fresh spring ingredients and flavor, this Ahi Tuna Spring Salad has become my new favorite go-to. If you give it a try, I know you guys will love it as much as I do! 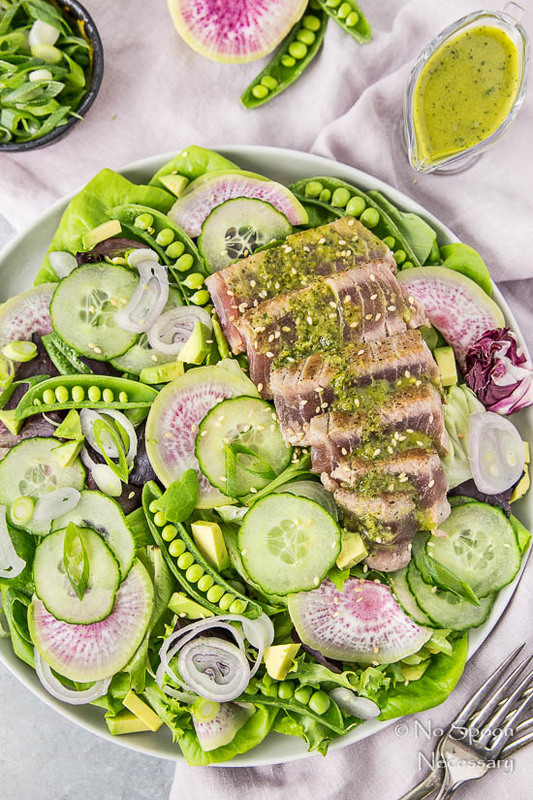 Loaded with fresh spring ingredients and protein packed, perfectly seared ahi tuna, this is guaranteed to become one of your favorite spring salads! Prepare the Vinaigrette: Place all ingredients, except the oil, in the bowl of a food processor. Pulse to combine. With the motor running, slowly drizzle in the oil until fully combined and emulsified. Taste and adjust for seasoning with salt. Sear the Tuna: Heat 2 tablespoons canola oil in a large skillet over medium-high heat. Season both sides of the tuna generously with salt and pepper. Sear tuna for 1-2 minutes per side for rare. Transfer to a clean cutting board and let rest for a couple minutes. When cool, slice into ½’’ thick pieces and transfer to a bowl. Add half the dressing and toss to coat and set aside. Serve: In a large bowl combine the ingredients for the salad. Add in half of the remaining vinaigrette and toss to combine*. Transfer the salad to individual plates and top with tuna. Serve immediately with remaining vinaigrette on the side. *For a mild vinaigrette remove seeds and ribs from jalapeno. *Tossing the salad in part of the vinaigrette is optional. You can serve all of the vinaigrette on side if desired. *Vinaigrette will keep in the refrigerator for up to 5 days, whisk well to re-emulsify. Cheyanne, I haven’t had time (or $$ for some nice ahi!) to make the whole salad, but I DID make the Asian Vinaigrette, and it was awesome! Put it on my standard lunch salad w/ the flavored tuna pouch and some hard-boiled egg, mighty tasty! Woot!! I’m so thrilled you liked the Asian Vinaigrette! 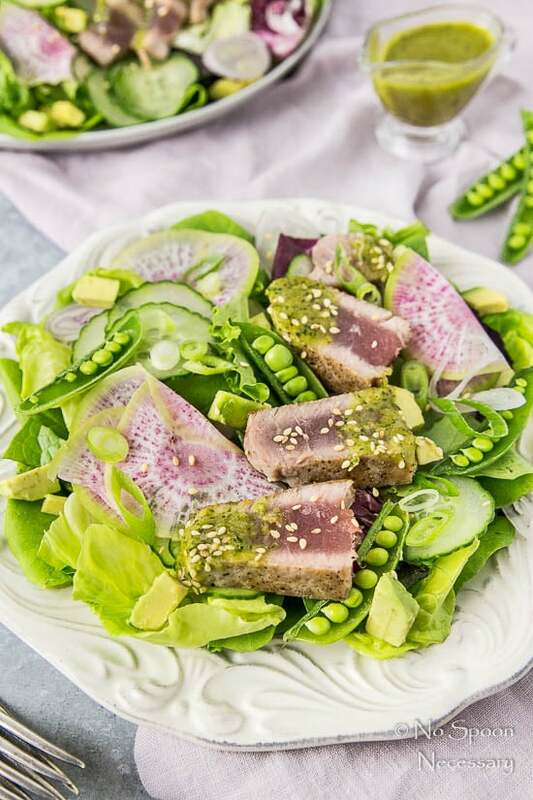 Using the flavored tuna pouch instead of Ahi and your standard lunch salad sounds like a fabulous way to make this recipe your own! Love it! Thanks so much for stopping by and letting me know how it went, I appreciate it! Cheers, friend!! My husband has always told me that people talk about you (good or bad) when you are doing meaningful work and making an impact. So in a sick demented sort of way I guess you should be proud of that spiteful comment . . . because girl your work is impactful enough that some jealous meanie was compelled to provide you with their opinion. Another way to look at it is that you are creating art. . .because art is meant to conjure up emotions (whether those emotions are positive or negative). So again. . .you should be proud because you are creating art worth talking about. Not everyone can say that. And to your point. . .why is meanie bo beanie stalking your site if they don’t like it? Hmmmm! Sounds suspicious to me. Jealousy. I think that motivates a WHOLE lot of the meanness out there. And being judgemental, and not being open to other people’s ideas and experiences. Sorry that you were someone’s target for their hate and personal insecurities – don’t take it to heart, or think it is anything more than someone making stupid snide comments to make themselves feel better! By the way this ahi tuna looks amazing too – seared tuna is THE BEST. So envious you guys are in spring already, and we are heading into winter! I can’t believe this person took the time to write that. People can be so mean! Your photos and food always look amazing to me! 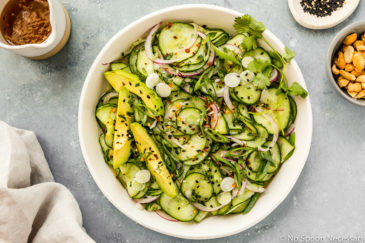 Just like this salad! It’s so pretty and I love the vinaigrette! I’m not sure what would spur someone to post something unkind. Out of all the things someone could do with their time why spend it being nasty. I agree with Rachelle, you have a terrific following, you’ve been “published” and your recipes and photos are amazing or we wouldn’t keep coming back. 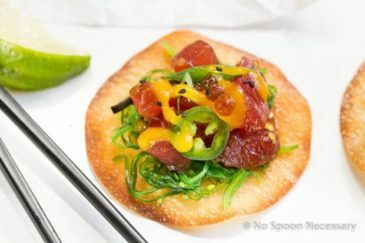 Speaking of…I love Ahi Tuna and I love the asian inspired flavors here! Perfection! Take care. 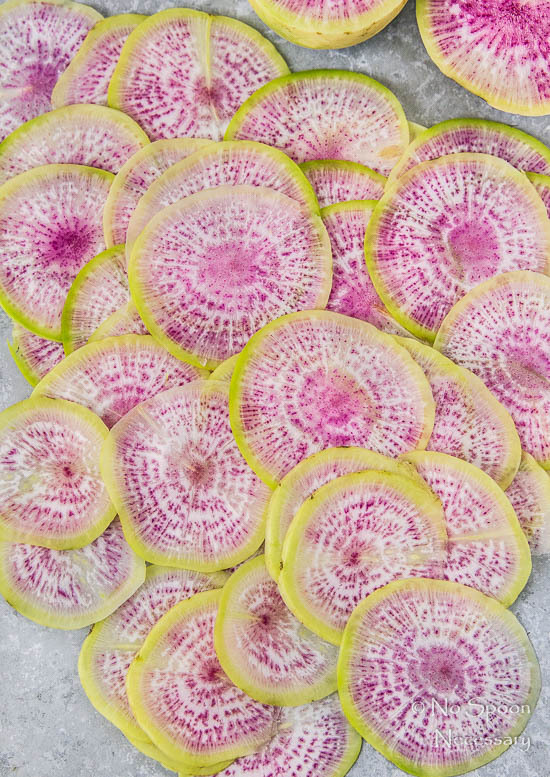 This salad is SO pretty. Seriously gorgeous. 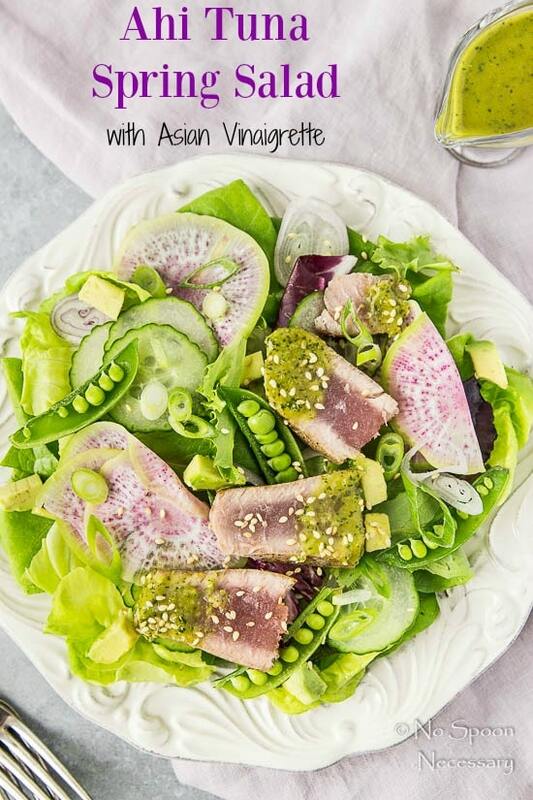 I love ahi tuna, and you’ve combined it with such perfect ingredients here, and such an awesome vinaigrette. Beautiful, Cheyanne! WOW, and here I was commenting this is a WORK OF ART. Some people may have opinions, but you sure don’t have to agree with them, right? Wow. Anyhow…. I think this beauty is just fine with the crunch appeal without the carrots, but hey, I’d add them, too! 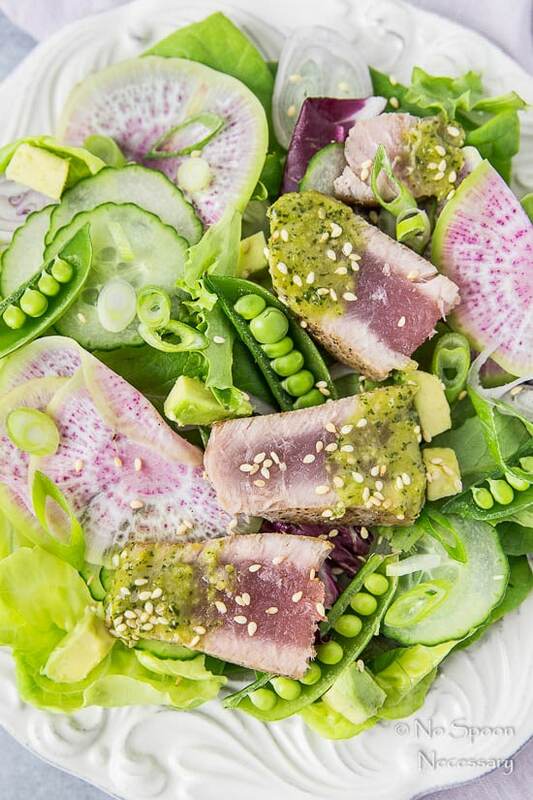 We love a good, HOT Cajun blackened seasoning on our ahi and I think it would work well with the vinaigrette. Happy Monday to you Chey.